Growing up Nekoda wanted to be a doctor. She was a top flight student, working hard to obtain and maintain good grades, managing her time around sport and contributing to the running of the family home. As judo became a bigger and more serious part of her life those goals changed and now Nekoda is looking forward to training to become a primary school teacher, in her retirement from elite competition. We shared a giggle at this change, as before coaching I was a primary school teacher. Despite first stepping on to the tatami at the age of 6, Nekoda had never competed or trained outside the UK, until obtaining her first passport, ten years later, at 16. She had been GB number 1 in her first Cadet year but couldn’t travel due to the lack of documents. 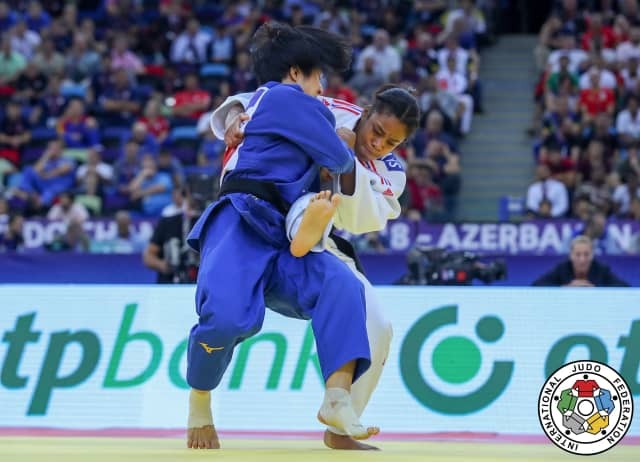 A year later the passport arrived just in time and Nekoda fought in Koper, Slovenia at the European Cadet Championships, her first international experience of any kind. Nekoda is the first athlete in her family. Her mum is a cleaner, dad is an electrician and one sister is in the army in America. I was honoured to work at the London Olympics in Lisa Allan’s ‘J-Team’, looking after administrative duties, including recruitment and scheduling of volunteers. Nekoda was one of them, alongside a number of her club-mates. Her experience in London gave her an added hunger, an extra push to feel the Olympic buzz again, but as an athlete next time… She did just that in Rio. Learning to speak Japanese has been a long-term goal, but with so much travel and the demands of an athlete lifestyle, regular evening classes were impossible. The solution? A teach-yourself-Japanese computer programme and a lot of revision and extension when training in Japan. The Tokyo Olympic and Paralympic Games is just around the corner and arriving without a language barrier can only enhance the experience. This goal is ongoing! As a youngster Nekoda took part in track-based conditioning sessions as part of her judo training. She was approached many times by the resident athletics team, who tried to poach her to become a sprinter. Judo is happy with her choice! In 2004 Nekoda won her first national medal, a bronze at the British Under 12 Championships. She didn’t know it was a national championships until afterwards, just taking it in her stride as another event. It was entered only 3 months after joining her local club, having become too old for her primary school judo classes. “The best food in the whole world is mum’s curry goat. Fact!” Nekoda notes that she loves food, most food, except pork chops. Pork chops are not on any Nekoda-friendly menu! She takes good care of her athlete stomach but also enjoys eating out with friends and being adventurous with new tastes… that don’t involve pork chops, of course. Nekoda is looking forward to the milestone events later this year, the European Games and, of course, the world championships.